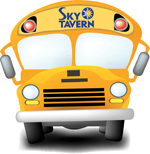 Children, ages 9 and up, wishing to ride the bus to Sky Tavern from an area drop-off location. Bus transportation is for one round trip ride to and from Sky Tavern. Students are required to show their id membership badges upon boarding the bus! Please pick up your ID Badge at the front desk.